Gemalto is providing Maryland’s Motor Vehicle Administration (MVA) with a full issuance and personalization solution to support the implementation of polycarbonate technology. The MVA will leverage Gemalto’s Sealys Secure Document and Coesys Issuance Solution to issue driver’s licenses and identification cards to its citizens. As part of the solution, Gemalto will be providing a new look and feel to the driver license and identification card incorporating new security features to help protect against identity fraud. The MVA has selected polycarbonate as the material of choice for the documents offering a wide assortment of easy to detect security features that are also difficult to replicate. Gemalto will also provide training for MVA employees to operate the central issuance solution and ongoing maintenance and support following the initial deployment targeted for 2016. DERMALOG Identification Systems unveiled the VF1 device that captures passports or ID cards in color. Infrared images and ultraviolet images of the documents are captured at the same time for evaluation of all security features of the document. An additional contactless smart card reader inside the device gets the data from modern ePassports or electronic cards at the same time. In addition, the new VF1 captures one, two or four fingerprints with 500 dpi resolution and 256 grey levels on the same single scanner plate. The VF1 confirms to all international fingerprint standards for AFIS and biometric identification. It captures up to four fingerprints in one scan. This new type of device has also got all features and functions of a tenprint scanner and of a so called 4-4-2 scanner. Ten plain fingerprints as well as rolled fingerprints can also be taken by the VF1. Additionally the new scanner has got the most advanced technology for detection of fake fingerprints, in order to prevent from any fraud or misuse. Smartrac announced the launch of new PRELAMs based on NXP’s MIFARE Plus SE chip, which enables Advanced Encryption Standard (AES) for authentication, data integrity and encryption. Tailored for automated fare collection and enterprise access control applications, the PRELAMs are available in PVC, PETG or PC materials. Smartrac’s PRELAM inlays provide a durable solution for the manufacture of finished cards. The portfolio has now been expanded to include products utilizing NXP’s MIFARE Plus SE chip, with improved chip security and originality-check function. Offering 1K EEPROM and full MIFARE Classic backward compatibility including value block support, MIFARE Plus SE offers a solution for upgrading existing MIFARE Classic 1K solutions to 128-bit AES security. Most MIFARE Classic customers can even map their existing card layout to MIFARE Plus SE. The Las Americas Golden Tower is set to offer guests advanced property security with electronic door lock and safe innovations by ASSA ABLOY Hospitality. Boasting 30 floors of guestrooms and amenities, the 285-room Panamanian property is on track to open in January 2016, equipped with VingCard Signature RFID door locks and Elsafe Sentinel electronic safes in all rooms and suites. With VingCard Signature RFID, Las Americas Golden Tower is implementing a contactless solution that enables guests and staff members to gain access to assigned guestrooms by tapping the keycard on the door’s reader. This technology provides the property with operational benefits as well, such as eliminating the potential for keycard de-magnetization. 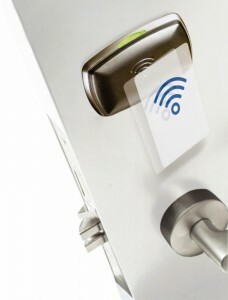 Leveraging the benefits of an online locking system, Las Americas Golden Tower also utilizes VingCard Visionline alongside Signature RFID; an enhancement that enables individual locks to communicate with the property’s server via radio frequency. With Visionline, staff members can easily extend hotel stays or re-assign RFID keycards to other guestrooms; eliminating the need for guests to return to the front desk, and also providing an efficient method of tracking access and remote cancellation of keycards.